A few apps have great names, and a few provide exceptional features, but Momento from d3i actually hits a high note on both counts. The name recalls the indie movie—by the guy who made the recent Batman films, no less—about someone who has short-term memory loss. Try to Remember: Momento lets you jot notes of the day for remember them later. The journal app also provides easy way to review your Twitter feed. The app can certainly help you battle that—it’s a basic journaling tool. You can tap in a short note about a momentous occasion or a brilliant thought. Then, you can open those notes according to a calendar or by clicking on tags such as a rating for that entry. You have to manually tag the journal entries, of course, which can be a pain. You can also add a photo for further memory jogging. 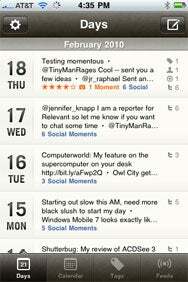 Momento has a clever way of adding your Twitter, Facebook, Flickr, or Last.fm status updates to your journal so that you can go through a calendar and recall those updates by date. Wondering what struck you as funny around late December? Momento helps you find out. You can even export your journal entries as an XML file you can use on a blog or Website. For an app costing $3, you will really need to be someone who wants to jot down journal notes. Other apps, like TweetDeck, show you a history of status updates, so Momento is really just a way to group them by date. However, the interface is easy to use and the app never crashed on me. I recommend it for any iPhone or iPod touch user who want to get into journaling. This is one of the better apps to fill that need.